You see it time and time again: curriculum is developed with a general idea in mind, lessons are crafted, and by the end, no clear learning has taken place. Has that happened to you? Have you invested in, and completed, a course that has left you wondering what you were supposed to get out of it? A course that has you realizing you didn't actually learn anything? Now that you’re developing your own (or thinking about developing your own), you know that you don’t want that to happen. 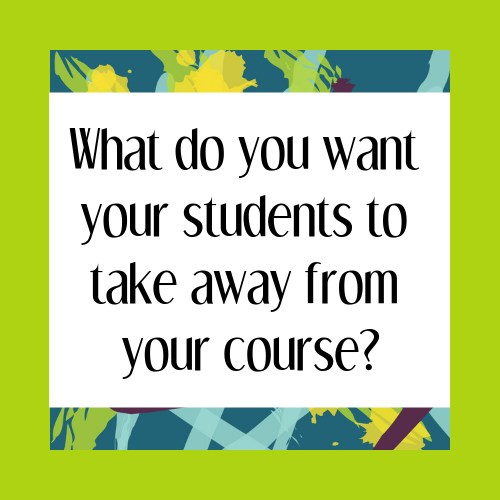 You don't want your students wondering what they were supposed to get out of your course. You don't want them thinking they learned nothing. So, how can you prevent this from happening? Your first step is to start at the end. Think about working in your kitchen. In order to successfully cook something, you need to have a clear understanding of what the end result will be. Otherwise, you’re just throwing random ingredients in a pan and hoping they come together. Having the dish in mind before you begin makes it easier to choose the right ingredients and the right tools. You have a better understanding of what steps must be completed, and in what order. You know when your dish is done. By understanding what the ultimate end goal is, the steps to get there become clearer. Creating a good course requires this clarity. How can you judge the strength of your lessons and modules if you don’t know where they should lead? How do you develop supplementary content if you don’t know what skills they need to teach and reinforce? Backwards planning means you are much more intentional in your planning. Knowing where you want your students to end gives you a guide for your entire course creation process. What do I want students to take away from this course? What are the tangible skills students will learn once they have completed this course? The answers to these questions will be your course objectives, and these will guide the decisions you make through the rest of your course creation process. What Are The Necessary Prerequisite Skills? Once you have identified your course learning objectives, you want to think about all the prerequisite skills your students will need in order to master them. Coming up with this list gives you the foundation for what your lessons and modules will need to cover. These prerequisite skills will help you determine the topics for each of your individual lessons and modules. They become “mini-objectives” that, together, lead to mastery of the course objectives. They’re smaller targets that give purpose to your individual lessons. In a later blog post, I’ll go into greater detail about planning your individual modules and lessons. But, it’s like the recipe analogy: In order to bake a chocolate cake, what are all the individual steps a baker needs to do? Once these “mini-objectives” are in place, developing the course content becomes much easier. If you’d like some help developing your course objectives and creating your course outline, set-up a discovery call to see how we might be able to work together!